Eleven years spent in Armagh's colours have earned Charlie Vernon the status of a father figure, but the Harps clubman now feels that the more recent recruits to the team can come of age at Croke Park on Saturday. Kieran McGeeney's restructured side will take on a Kildare outfit anxious to atone for their defeat to Dublin in the recent Leinster final in an All-Ireland Round 4B qualifier that has captured the imagination of the entire country. 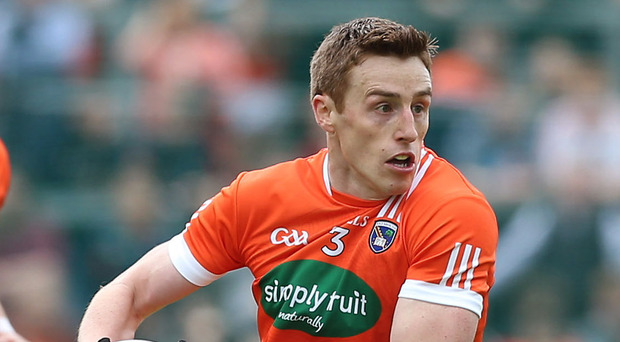 And Vernon, a defensive stalwart who is proving an inspiration to the fresh blood in the Armagh line-up, believes their youthful cohorts will stand up and be counted at Headquarters. "We have players like Aaron McKay, Stephen Sheridan, Niall Rowland, Ciaron O'Hanlon, Blaine Hughes and Niall Grimley who have come in and put their shoulder to the wheel. They have put a lot of effort in and it's great to see them performing well at a high level but obviously this game against Kildare will be a huge challenge for us all," stressed Vernon. Manager McGeeney's decision to keep faith with his newcomers appeared to have backfired to some extent when his team were unable to haul themselves out of Division Three and a subsequent Ulster Championship quarter-final defeat to Down raised more questions about their durability. But qualifier wins over Fermanagh, Westmeath and Tipperary to date have reignited ambition within the side, although Vernon accepts that Kildare will make big demands on his team. "The hope is that we will continue to improve and I believe the boys are ready for this test," he said. "Kildare will be very keen to get back on the rails after that loss to Dublin and obviously they will have huge support." Kildare boss Cian O'Neill is boosted by Kevin Feely's availability and Vernon recognises that his aerial ability coupled with his free-taking can make him a considerable force. "While we recognise that Kildare will feel they have a big point to make, I still think that if we bring our best game to the table we will be difficult to beat," insisted Vernon. Niall Grimley's eight points (six frees) in the win over Tipperary, the increasing authority of Blaine Hughes between the posts and Aaron McKay's versatility are just some of the positive factors that can buttress the Orchard challenge. Kildare may be next door to Croke Park but their playing record there does not inspire confidence. Up until the Leinster final loss to Dublin, they had won only five of their previous 20 league and Championship matches at Headquarters. But Vernon maintains that statistics will not influence Saturday's contest. "Every game takes on a life of its own and you just have to focus on what happens on the day," he pointed out. In an era when players are drifting away from county squads, Vernon's commitment to the Armagh cause remains absolute. Now living in Magherafelt, he travels daily to his work as an accountant with Westland Peat in Dungannon while his wife Joanne heads off in the other direction to fulfil her role as a dental surgeon in Coleraine. The couple are proud parents of the fourth Charlie Vernon in the family, their baby son, who is obviously the apple of their eye. The Armagh full-back's grandfather and dad were both named Charlie and now the family tradition is being maintained. "Obviously there's a bit of travel involved on a daily basis and then there's training, team meetings and matches as well, of course, and other aspects of family life to be fitted in but I wouldn't have it any other way," smiled Vernon.